The second lecture under COMSATS’ Science Diplomacy Programme was delivered b y Executive Director COMSATS and COMSATS’ Science Ambassador Emeritus in the field of Science Diplomacy, Dr. Imtinan Elahi Qureshi, in a select gathering of scholars and academicians at the Faculty Development Academy of COMSATS Institute of Information Technology (CIIT), Islamabad, on February 29, 2016. The lecture entitled ‘Science Diplomacy: An Overview’ outlined how ‘science’ and ‘diplomacy’ come together in various forms serving related but different purposes, i.e., one supporting the other and vice versa, as well as the two complementing one another for interaction with the outside world. Dr. Qureshi highlighted how the coupling of the two somewhat paradoxical terms leads to a whole that has helped individuals, groups and even nations overcome their intellectual and political differences, leading to stronger and wider collaborations across the globe. The lecture provided a historical context of Science Diplomacy, as well as its re incarnation in the modern world. He highlighted the role of the American Association for the Advancement of Science (AAAS) and Royal Society for the advocacy of science in the past. Defining the scope and dimensions of Science Diplomacy, the related mechanisms in place in developed countries were also discussed. It was noted that Science Diplomacy is being used as soft power by developed countries through disbursement of aid, technology-transfer and sharing of scientific know-how. Dr. Qureshi quoted the successful Science Diplomacy ventures, such as: European Organization for Nuclear Research (CERN), International Thermonuclear Experimental Reactor (ITER), and International Space Station (ISS). How the developing countries could benefit from Science Diplomacy was also discussed, especially in the context of Pakistan. It was noted that Science Diplomacy can help the developing countries on three major fronts: Capacity Building; South-South Cooperation; and preservation of National Resources. Dr. Qureshi also lauded the science diplomacy efforts of specific nature made by Cuba (Medicine), and Brazil (Agriculture), as well as other initiatives and institutional mechanisms applied in Africa (NM-AIST), Asia (ECO), and the Middle East (ESCWA). 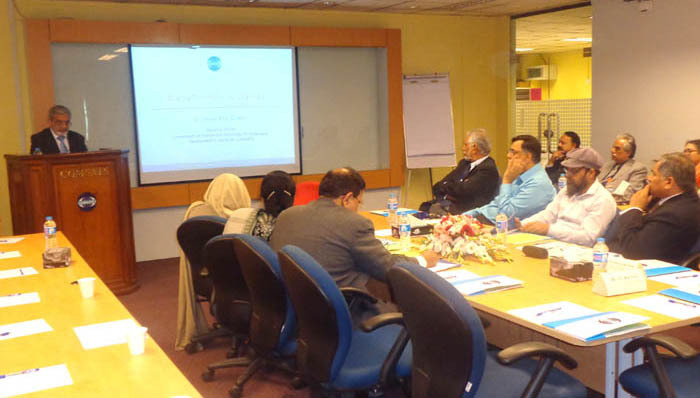 Apart from COMSATS’ science diplomacy efforts since its creation in 1994, the organization’s recent activities in this regard after the first Round Table Meeting on Science Diplomacy in the South in February 2015 were recounted, which included: designation of Science Ambassadors, entering into collaboration with The World Academy of Sciences (TWAS) and, participation in AAAS – TWAS joint training programmes, initiation of public lectures, and necessary media projection of the Science Diplomacy programme. 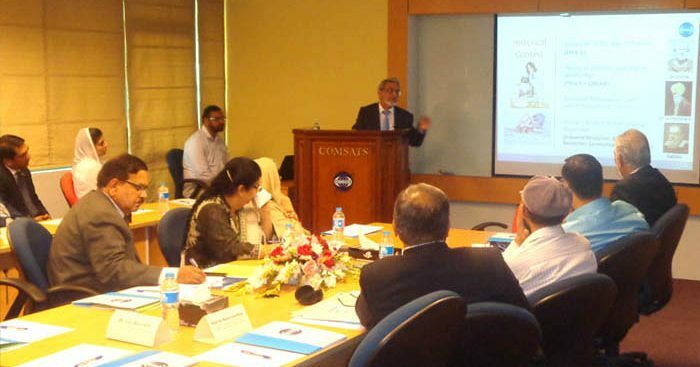 Dr. Qureshi also indicated COMSATS’ other important interactions in this regard that include active liaison with the diplomatic missions in Pakistan and other Member States, and joint research programme, entitled COMSATS’ International Thematic Research Groups. 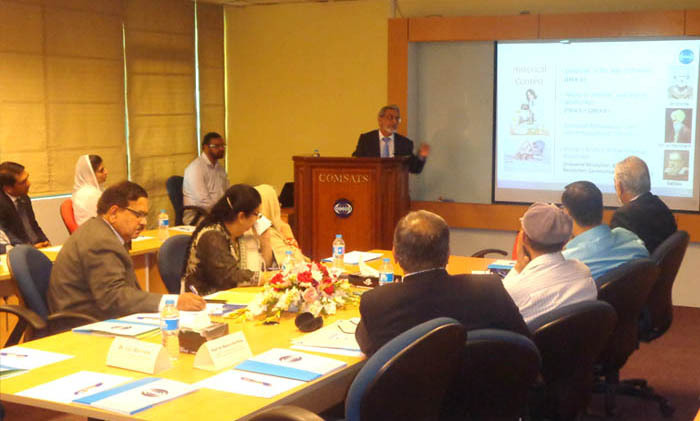 Dr. Qureshi concluded his lecture with two proposals from COMSATS for urging the Government and other relevant institutions of Pakistan; one urging appointment of a Science and Technology Advisor to the Prime Minister of Pakistan, and the other institutionalizing ‘Grand Challenges Pakistan’ for identifying and addressing major issues of Pakistan and working out their practical solutions through Science and Technology. It was noted that Canada, India, Israel, Thailand, Ethiopia, Brazil, Japan, China, as well as Africa are already benefitting from such initiatives taken by governments or independent organizations. Such programmes should be emulated to have targeted solutions for specific issues of the countries based on indigenous existing or improvised means. The lecture was followed by a questions and answers session that had participation from individuals belonging to various fields of specialization and backgrounds, including, biosciences, mathematics, physics, chemistry, management sciences, environment, and public policy. 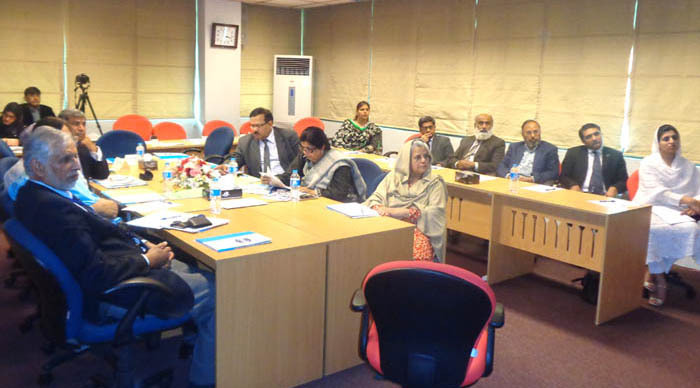 In addition to making queries regarding the contents of the lecture and making relevant recommendations, the participants appreciated COMSATS’ aforementioned proposals and advocated necessary campaigning in this regard. They also took stock of the fields of science and technology in Pakistan that need to be aided through Science Diplomacy, such as food security and health. It was agreed that politicians and policy makers need to be sensitized on such pressing matters by scientists and relevant organizations and institutions. Moreover, it was urged that science diplomacy should be fully utilized to motivate collaborations in matters of trans-border nature, such as climate change, pandemics, and regional conflicts. At the conclusion of the event, Dr. Qureshi urged the participants to make concerted efforts to realize the objectives of Science Diplomacy, as well as to achieve the goals and targets suggested in their recommendations. Hoping to regularize the lecture series to a lecture every month, he invited them to become active participants of COMSATS’ Science Diplomacy Programme.